Fortescue is the world’s fourth largest iron ore producer, the owner and operator of an integrated supply chain comprising iron ore mines in the Chichester and Hamersley Ranges, 620km of the world’s heaviest haul railway and the Herb Elliott Port in Port Hedland, using the latest technology and operating five berths. only iron ore major to not channel iron ore through offshore tax minimising marketing hubs. Australia must ask itself if the skewed business playing field working against locals is what it wants? argue they are simply running their machines hard. In other words, seemingly suggesting that their machines set their corporate supply strategy. We have completed our growth capital expansion phase and are now well positioned to fully optimise our world class assets. The cash cost across the ship’s rail (C1) was lowered to US$27/wmt, a reduction of more than 21 per cent over the prior year. For FY16, Fortescue has provided guidance for C1 of US$18/wmt and will maintain its unwavering focus on further improving its competitiveness. lower capital expenditure of US$626 million in FY15. With steady state operations for FY16, the quality of the newly commissioned assets will allow for capital expenditure to be reduced further to approximately US$330 million. reduce gearing levels and repay more than US$3.7 billion of debt since late 2013 with US$500 million repaid during the financial year. In FY15 Fortescue also successfully refinanced US$2.3 billion of near term debt, with the earliest debt now maturing in 2019.
targets a gearing level of approximately 40 per cent. With more than RMB 10 trillion in approved projects, pro-business structural reform and continued urbanisation at a rate of 10 million people per year, China has reaffirmed its objective of ensuring ongoing GDP growth of seven percent. Further easing measures have been announced aimed at stabilising and supporting the Chinese property market which remains a major driver of steel demand. The latter part of FY15 has seen the market rebalance as port stocks and steel stock volumes returned to lower levels consistent with historic averages. While ongoing balance in the physical market is anticipated, Fortescue expects continued volatility through FY16 to be amplified as sentiment continues to be a major driver of unprecedented churn in Chinese derivatives. The Company’s railway consists of 620km of heavy haul rail track and is the fastest and heaviest haul line in the world. Fortescue pays 7.5 per cent state government royalty for a majority of its products, with a concession rate of 5 per cent applicable for beneficiated fines. 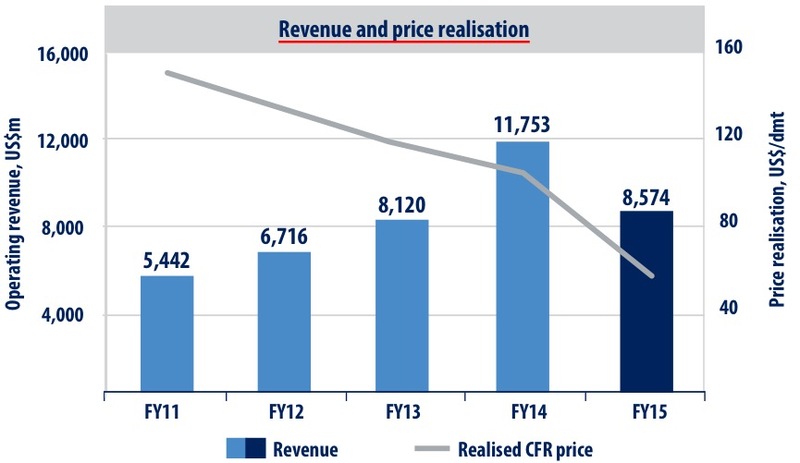 Royalty charges decreased to US$516 million from US$775 million in prior year consistent with the lower revenue base. highly flexible debt profile with no maintenance covenants and the earliest debt maturing in 2019.
not planning to invest in any additional production capacity. 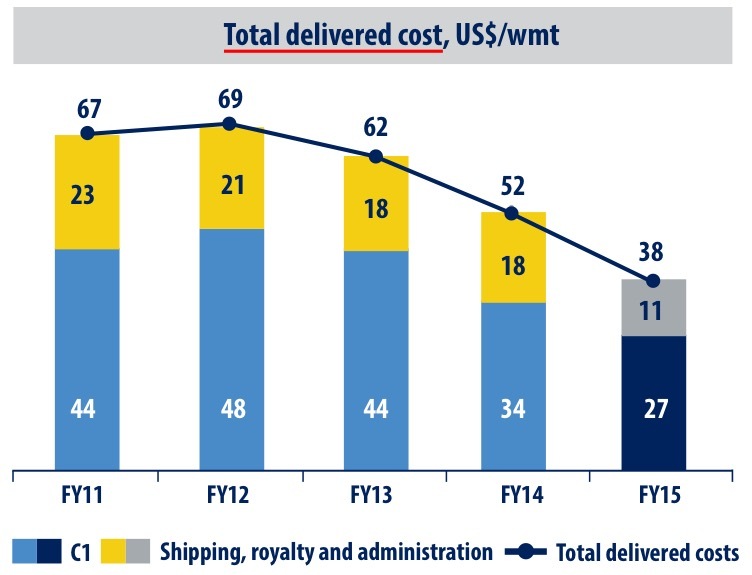 Capital expenditure in FY16 will be limited to sustainably support the existing operations, estimated at US$2/wmt. Hematite Ore Reserves total 2.4 billion tonnes (bt) at an average iron (Fe) grade of 57.3 per cent. Combined hematite Mineral Resources total 11.6bt at an average Fe of 56.9 per cent. Magnetite Ore Reserves total 0.7bt at an average mass recovery of 27.2 per cent. Magnetite Mineral Resources total 5.5bt at an average mass recovery of 23.2 per cent.